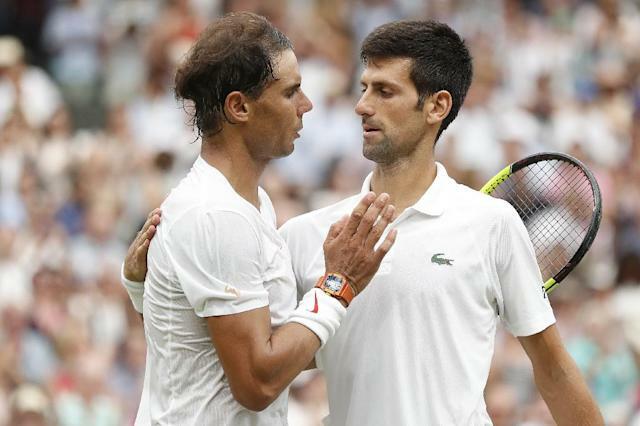 London (AFP) - Novak Djokovic confirmed on Friday that his controversial exhibition match against Rafael Nadal in Saudi Arabia is off because the Spaniard is injured. The two players had been due to meet in Jeddah's King Abdullah Sports City on December 22 but faced calls to withdraw following the murder of Saudi journalist Jamal Khashoggi in the country's consulate in Istanbul last month. Asked if now the exhibition was not happening, Djokovic, speaking ahead of the start of the ATP Finals on Sunday, said: "Yes, it's not happening." When questioned whether that was because Nadal was injured, the new world number one said "yes". Nadal confirmed on Monday that he will miss the season-ending ATP Finals and that his season is over due to injury. The Spaniard said he needed an operation on his right ankle and is also yet to recover from the abdominal problem that kept him out of the Paris Masters, meaning Djokovic is guaranteed to end the year top of the world rankings. Djokovic and Nadal have played 52 times in their careers, with the Serb leading their head-to-head 27-25. Roger Federer, who is also in the eight-man field for the ATP Finals at London's O2 arena, revealed last week that he had received an invitation to take part in the Saudi exhibition but said he had turned down the approach. "I didn't want to play there at that time. So, for me, it was a very quick decision," said Federer. Saudi Arabia has hosted a series of international sports events in recent months. The moves are seen as part of Crown Prince Mohammed bin Salman's drive to open up the conservative kingdom after being named heir to the throne in June 2017. But despite moves by the young prince to modernise the economy and society -- including lifting a ban on women driving -- the country has stepped up repression of religious, intellectual and feminist dissidents.